Which direction on the M2? I am in the process of ordering a BMW M2. I have seen really good revues, but I am unsure whether to go for a manual or automatic, and is the colour important when I come to sell it on in a few years? 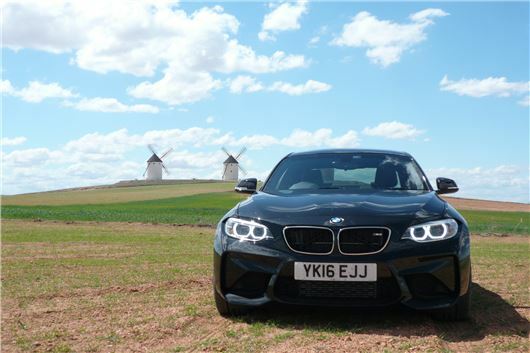 My test here: /road-tests/bmw/bmw-m2-2016-road-trip/ Unless you want to burn rubber all the time like the overage children you see on YouTube, go for the DCT. It's much more economical. Colour is a personal choice. I liked the look of it in black. Subtle. And meaner. You could save £10k by going for an M240i that gets to 60 in 4.6 instead of 4.1, but it is nothing like as stable as an M2. My wife has a 2009/59 Skoda Fabia 1.4, currently on Bridgestone tyres for summer and we swap to full winter tyres November to March each year. Having just retired and found out our local tyre chappie is charging £18 for a single wheel swap (yes, surprised me too) and she needs a new set of tyres now, I think all weather tyres would be best (especially as we have just relocated to Dorset and do not appear to have the same problem with snow we had in the Midlands), so wonder if you can suggest a brand suitable. We also have a set of full winter tyres on steel rims which will be useless here: 4 years old and only had about 4,000 miles use over 4 years, no use in the past 2 winters since we moved here in 2015, ebay value £200, would you suggest? Sell the winter tyres and rims on eBay and get a set of Michelin Cross Climates for the Fabia. These have multiple benefits in everyday driving besides cold weather benefits, and no wear rate or fuel economy penalty. I ran a set on an HR-V for 10,000 miles. We have a 2013 BMW X3 diesel auto. We like it a lot, but now would like a petrol auto SUV: possibly a hybrid-because of our age, lack of agility and a wish to have some warranty years (on the car).We would prefer a one-year old car and have looked at a 2016 RAV-4 and a Lexus NX300H Luxury and like both, although we haven't yet had a motorway test-drive. We both like to drive quickly and are not averse to using the accelerator .These Toyota models have not featured favourably in your recommended vehicles as far as I can remember. Over many years I have believed in your good advice. Could you help me again? If not one of these, which other makes would you recommend? We have £15k-£18k to add to the exchange value of our BMW worth £13k. We haven't driven the BMW 330e plug-in hybrid, but a reader has run one in Ireland for 18 months and reckons it’s excellent. Toyota has just expanded its range of RAV-4 petrol hybrids. I'm not keen on the Lexus NX that shares the RAV-4 hybrid's drivetrain. The Toyota C-HR hybrid rides and handles brilliantly: /road-tests/toyota/toyota-c-hr-2016-road-test/ There are more petrol hybrid SUVs on the way from Audi, BMW and Mercedes. The KIA Niro is good, but might be below your expectations. A hot hybrid 4WD possibility is a MINI Countryman PHEV, but the entire 2017 UK allocation was sold out by October and I doubt you’ll find an ex-demonstrator. I get a noise from the rear of my 2005 Jaguar X-Type 2005 estate, which, when it occurs it does so intermittently toward the end of long motorway drives (but does not occur on local trips). My independent Jag dealer said he could find no fault and suggested I continue to use the car until it occurs frequently so that he can reproduce the noise. There has been no change over the last 3 months and I have to make visits of 200miles over the next few months and am reluctant to do this so with this fault, so I am considering having the wheel bearing changed as that seems the logical fault (the hub is quite hot after these occurrences). As this is fairly costly, could there be any other explanation I should consider. Just as I was about to buy my 180 BiTDI VW Transporter at the end of the lease, as I had been so happy with it, the oil light came on. No leaks, so the engine must be burning the oil. I had an oil sample tested by Millers and this showed the oil to have critical amounts of Al and Fe. The Al comes from the corroding EGR cooler, the Fe is the cylinder bores being worn by the Al particles that have got into the engine! In short a new engine and ancillaries is required at a cost of £8,000. Suffice to say I decided not to buy it. There is a Facebook page with over 1,000 Members devoted to the failings of the 180 BiTDI engine. It is only this engine that suffers. One chap in Norway runs a fleet of 30 ambulances and every one has needed a new engine. The EGR cooler is poorly designed: hot air condenses on unprotected aluminium, causing it to corrode. VW has brought out a revised cooler but it is too early to say if it is successful. And once an engine starts to burn oil through worn cylinder bores, the damage has been done. A great shame because in every other respect I was delighted with the vehicle. But never again. My daughter bought an Audi Q5 automatic from a dealer in December 2016. Almost immediately, she noticed a problem changing gear. She took it to a garage that diagnosed it needed a new Mechatronic and Clutch Pack, which will cost around £4,000. She took the car back to the dealer within the 6-month warranty period but he said he couldn't find a problem with it. Since then, the car has become undrivable and the dealer is refusing to do anything about it and seems to be what I can only describe as a cowboy. What might the solution be in these circumstances? I have a 1999 VW Passat 2.3 VR5 Estate. It has done only 85,000 miles, but it is 18 years old and the cooling system is, allegedly, one of the weak points of this car so I was not unduly concerned when, at the beginning of the year, a spot of coolant about half the size of a 5p piece appeared on the garage floor a couple of times a week. The size and frequency of the drips never changed so, although the dealer carrying out a full service in June reported coolant stains on the rear of the engine and recommended a pressure check to identify the cause, I declined, saying I would keep an eye on it. On 6th September I found a small pool - about the size of a 50p piece, so, as I was due to make a trip to Cardiff on 14th September, I booked it in for the pressure test on 11/9. The garage duly reported that the secondary cooling system pump was the cause of the leak and they could source and fit a replacement within 48 hours. Their invoice for £531.29 stated: CARRIED OUT PRESSURE TEST, LOSING PRESSURE ON TEST, STAINS AT REAR OF ENGINE, TRACED FAULT TO SECONDARY COOLANT PUMP LEAKING, REPLACED PUMP AND TOPPED UP COOLANT. The trip to Cardiff and back on 14/9 went without hitch, I didn't use the car on 15/9, we went on holiday on 16/9 and the car wasn't used again until 25/9 when I found another 50p sized puddle. They are having the car back on 3/10 for investigation so my question is: Am I entitled to say to the garage "You gave me a specific cause and solution, without ambiguity, so there should be no further leakage. It would be an impossible coincidence for a new leak to develop within seven days of the repair. The initial diagnosis was therefore faulty, possibly only a guess, or the fitting of the new pump was botched. You should either refund the initial £531.29 and we'll start again or you keep the payment but guarantee a free fix, whatever else is found." Or am I completely skewered? It is possible for another leak to have occurred such as head gasket failure, which is common on VR5s and VR6s. Or for a gasket used in fitting the secondary pump to have failed. Or (and this has happened to me) for the new pump itself to prove faulty. So I'd hold off until the garage has diagnosed why the second leak occurred. I have run a manual BMW 335i M Sport Touring since 2010. I'm considering replacing it but BMW, and seemingly most other manufacturers, have now dropped the option of a manual gearbox. I appreciate that millisecond changes in automatics are quicker than clutch and gearstick, but manually matching road and engine speed is a skill and one of the few motoring pleasures left. My specification is very simple. Power 250bhp+; manual transmission; either an estate or a 'dog friendly' saloon boot. So far, the only vehicle that I can find that might meet my need is a SEAT Leon Cupra ST: have you any others you could suggest? That’s right. You can get the 340i saloon as a manual, but not the 340i Touring. Funnily enough I was going to mention the Leon Cupra ST before I got to the end of your email. A few others are the Peugeot 308 GTi with 272HP, 330Nm, a 6-speed manual and a Torsen diff that gets the power down; the slightly more unruly Honda Civic Type R with 320HP that can get a bit torque-steery but is very quick; or, of course, the Focus RS; or the ferociously fast 340HP BMW M140i that goes almost as well as an M2 (but isn’t as stable). My wife has a 10-year old Fiesta 1.4 Style but, with recently-diagnosed Parkinson's disease, is finding it increasingly hard to get in and out of the passenger seat because it is a bit too low. My own BMW 3 Series has even lower seats, so we use it only for long journeys. I have tried on the Internet without success to find spacers to raise the passenger seat an inch or so, but they seem not to be available and some reporters say they would upset the centre of gravity or the impact position of the airbag - which I think is rubbish because passengers vary enormously in height and weight. The driver's seat in this model has a height adjustment lever and mechanism but the passenger seat does not. If we replace the passenger's seat with a second UK RHD driver's seat, the height lever would be in the middle of the car and would probably be unusable. I don't believe the highest-spec Fiestas of that age have passenger seats with height adjustment, but if you tell me I am wrong I could try the recycling firms around the country (such as 1stChoice Spares), looking for either a new or used example. If there are No height-adjustable Fiesta UK passenger seats, is it possible to source a European (LHD) driver's seat anywhere in UK (e.g. from Ford UK) so that its height lever will be near the passenger door and accessible. And if available, would this constitute "modification" as defined by Insurers. A friend who used to own a body repair shop warns me that the fixing points on the LH and RH floor may be in mirror image patterns, but a European LHD Drivers seat would normally be fixed on the left and so should be a drop-in fit. It seems wasteful to have to sell a perfectly usable vehicle that my wife loves, with only 40,000 miles, a fresh new clutch and cam belt, just to get a car with a higher passenger seat. Please tell me if there is a solution or if I am on a wild goose chase? It's a matter of either finding a UK parts specialist who can source a height adjustable drivers seat from a LHD Fiesta, or going on the Internet and searching yourself. I tried Googling <LHD height adjustable driver's seat for 2007 Fiesta> and the first to come up was a LHD Fiesta with a height adjustable driver's seat for sale at the LHD place. It’s an extreme solution, but you could, conceivably, buy that, swap seats with your car, then sell it again. We would like to get some advice on what approach we should take with Subaru in our current situation: a catastrophic engine failure in a Subaru Outback Boxer D at under 60,000 Miles. Our car saga has been going on since July and we haven’t had a family car since then which, along with the money worries, is causing us significant stress. We purchased the car, registration GK60 VCN, in March 2016 with 36,409 miles at a price of £11,450. It had a full Subaru service history and we have continued to have it serviced at our local Subaru dealership. The first oil problem was identified on 19th July. Our Subaru garage advised that the most likely fault was the oil cooler pump and that this required changing. They advised that this was the first “port of call” and if unsuccessful it may be that the head gaskets would require replacement. Within 30 miles, the same warning light came on again. We were advised that since the issue was not with the oil cooler pump, the problem must be with the head gaskets and that this therefore required replacement. We were made aware that this was a large mechanical job again. The old gaskets were removed and indeed there was a visible problem with the gaskets (which we have retained and have in our possession). Once complete, the garage road-tested the car for 200 miles before returning it to us. Initially, the problem appeared to be resolved, but within 180 – 200 miles, the same warning light came back on. This was on 18th August. We were advised that there had been a catastrophic engine failure and that it needed a new short motor: an entirely new engine (at this time, the mileage was 59,645). In our opinion the dealer has done everything correctly, and has used its best endeavors to resolve the problem with the vehicle. He has kept us regularly informed with progress and provided a courtesy car for much of the time that the vehicle was with him. We are advised that this type of engine failure in a Subaru vehicle of this age and mileage is entirely unexpected and should not have occurred. At the moment we are left with invoices totalling £3,346 and a car cannot be driven without a further cost of £5,941. The market value of the car intact is only £8,000. We have tried approaching Subaru Head Office (IM Group) directly to make a claim that the car was not fit for purpose. They forwarded us to the Motor Ombudsman who has told us we can only make a claim against the dealer who sold us the car. However we don’t feel the garage is at fault and that it is clearly a fault with the car. From reading online forums we understand there are problems with this particular Boxer engine that are just beginning to come to light. Would you advise that we continue to keep fighting our case? We made a big financial decision to buy this car as we trusted the Subaru brand and had been told about the reliability. There has been a catalogue of disasters with this engine in various Subaru models: Impreza, Legacy, Outback and Forester, so the dealer assertion that "this type of engine failure in a Subaru vehicle of this age and mileage is entirely unexpected and should not have occurred." is cobblers. See: /carbycar/subaru/legacy-and-outback-diesel-2008/ The advice from the Motor Ombudsman that your claim is against the "supplier" and not the manufacturer or importer is correct in law. I'd say that since the disputed amount is now £8,000 (because you did get nearly 24,000 miles use from the car), you should take the matter to Small Claims in the County Court against the dealer who sold you the car. My interpretation of your rights is here: /faq/consumer-rights/ Your case absolutely depends on you having had the car correctly maintained during your ownership. If you missed an oil change, even by as little as 2,000 miles, your case could fail. 36,000 miles over 6 years in a diesel. Unfortunately its a potential disaster waiting to happen, low mileage is simply not good for a modern diesel whoever manufactures it. Umm, not quite...clio 1.5, 10 plate, 49000 miles, nil engine issues. It often can depend on the length of each journey and type of road driven on, and not the overall annual mileage. A car doing 5k miles a year, but say once a week for a 100 mile round trip on fast-flowing A-roads, dual carriageways and/or motorways out of peak hours (so not in jig-jog traffic) will probably be fine, as the DPF will almost always passively regenerate or at least have more than enough time to actively do so during such journeys. The opposite would be for a car that does lots of urban, slow-speed driving, such as a mummobile, even if that included many journeys and the occasional longer trip to friends and family but sparingly. Of course, some diesel engines seem, howevere they are used, to be more susceptible to their DPFs clogging up than others. You may have been lucky if you were nearer to the first group if drivers, whereby a good long run at 50/60mph+ once a week would clear the DPF, or it could be pure luck that you did so less often but exactly when an active regen was required. I presume you've owned yours from new to give you a full ownership history to make the comments you did? @ GC in Penrith - it's worth looking at a 225xe plug-in hybrid. MPV versatility, high driving position, 4wd available and it can really shift when needed (the Mini Countryman plug-in uses the exact same powertrain and is basically the same car underneath). Charges in 3 hours from a conventional 13A socket, and will do 15 miles or so in pure electric mode. Not many around in the UK but worth seeking out. a small tip for those looking at nearly new/used cars, depending on how you are financing, check the monthly payments on your nearly new (say 1 year old), and then look at the cost of a new model with same spec. I have found with several brands, the nearly new/used model is more expensive on finance, than a brand new one with dealer/manufacturer discounts & incentives, plus its usually the latest model and options. as in all large purchases, it can pay to do your homework first. Pre-2009 diesel engined cars are no trouble. The problems start after DPFs are made mandatory, and more recently the AdBlue issues especially with VW/Audi/Skoda/Seat diesels. Just avoid these diesels like the plague.